Stay organized, even when you're on the go. Inside pockets with clear indexed dividers distinguish this file from others. Cover flap and elastic cord secure contents. Smead Expanding File, 12 Pockets, Letter, Blue/Clear - Transport File is the perfect way to organize different parts of any subject or project. 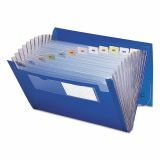 12 clear indexed dividers create 13 pockets for organization. Each pocket expands to 7/8. Includes preprinted and blank tab inserts. Two clear pockets on front are designed for business or title cards. Made of super-durable, tear-resistant and waterproof polypropylene that is acid-free and archival-quality. Includes colored tab inserts printed with alphabetical and monthly headings. Secure transport file with elastic cord closure. Two clear front pockets hold business or title cards. Super durable polypropylene construction is waterproof and tear-resistant.